John Hutton said the Severn Barrage concept was "visionary"
The government has announced a fresh feasibility study into the Severn Barrage, a tidal power plan that could provide about 5% of UK electricity. Speaking at the Labour Party's annual conference in Bournemouth, business and enterprise secretary John Hutton said the concept was "truly visionary". Some environmental groups have warned the barrage could affect wildlife. The idea was first floated about 150 years ago, but environmental and cost concerns have always blocked approval. It was last seriously considered in the 1970s and 80s. Last year's governmental energy review opened the door again, saying that the barrage should be re-evaluated. Now Mr Hutton has signalled that a multi-million pound feasibility study will go ahead, citing climate concerns as the main driver. "The government Gordon Brown leads will not be among those who say they want to tackle global warming by moving to low-carbon energy sources, but then oppose every opportunity to do so," he told conference delegates. 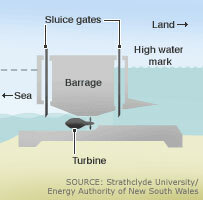 The study will examine the social, economic and environmental aspects of the barrage. 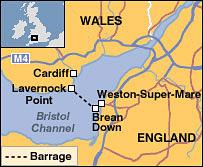 It could extend from the South Wales coast near Cardiff across the estuary to Weston-super-Mare. Reaction to the announcement from conservation groups has not been positive. The Royal Society for the Protection of Birds (RSPB) said the barrage would put thousands of birds, salmon and other fish at risk. The estuary contains mudflats, saltmarshes, rocky islands and food that support some 65,000 birds in winter. "The Severn estuary is one of the UK's most important sites for water birds," said the RSPB's conservation director Mark Avery. "A barrage would do enormous damage. There could be much better ways of harnessing the Severn's power, and the feasibility study should examine tidal lagoon and tidal stream schemes which could do less damage and generate more energy." Tidal lagoons are artificially created offshore pools. Water would flow through turbines in and out of the lagoons as the tide rose and fell. Some analysts say this could generate more power than the barrage with less local environmental disruption. 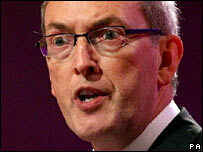 With the barrage carrying an estimated £14bn price-tag, some believe the lagoon concept would also be cheaper. However, it could not provide the potential economic side-benefit of a new connection between Wales and southwest England.